Welcome to our first sneak peek article for 2015! Its an information one on our planned expansion and final piece of the initial ranges for the Humans of the Prydian Precinct the Planetary Militia. As the auto-trainer has informed you already these are the planet bound local defenders who make up the bulk of soldiers in any conflict inside an atmosphere. Not fantastic like Starvaulters, not super armoured and life long fighters like Retained Knights and Desteria Knights and not as well trained as the Muster they are the part time or the local army of a world. This expansion to our 15mm range dove tails into The Ion Age but it can also be used for near future or post apocalypse wargaming as its technology level is nearer to our own and not as space opera as the rest of the Prydian Army. We see the 'Planetary Defence Forces' as they would call themselves as the soldiers that best represent the imagined equivalent of our own modern and near future armies on Earth in the real world. Seldom do they consider events beyond their own world and not often do they venture outside of its atmosphere. Instead they fight insurgents or invaders both Human and not as they made themselves known on that world. They could be in any colours of uniform and have back stories that suit their varied planets. 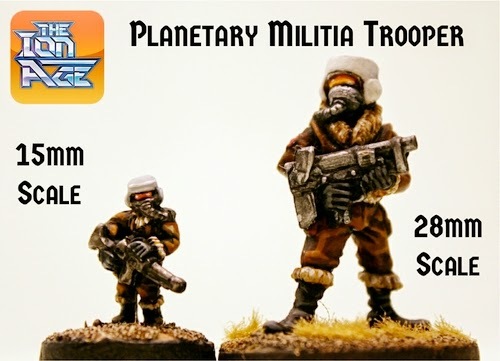 Above is an image of one of the original 28mm scale Planetary Militia miniatures from our ranges. 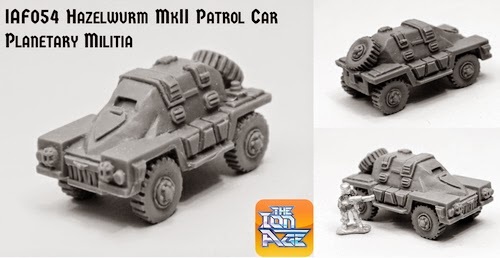 It is from this template of style that we have created the new 15mm Planetary Militia miniatures. They stand next to each other separated by scale and by nearly two decades of real world time. A familiar but at the same time rather unique look don't you think? Scaled down to perfection. The next phase follows in March but it means you can get your whole infantry platoon and light vehicles before we bring out the support options. Details on that end of this month but releases begin in one week on the 12th February 2014 right here at The Ion Age. I liked the Colabreta when I first saw it, but I think the Hazelwurm is my new favorite! (great name too). I like the troopers' look with the breather masks too. They'd make good disembarked flier crew, or it'd be easy to sculpt hoods over their helmets for a real winter warfare look. Sculpt the same mini in a greatcoat and you'll have the perfect post-apocalyptic/sci-fi neo-soviets! 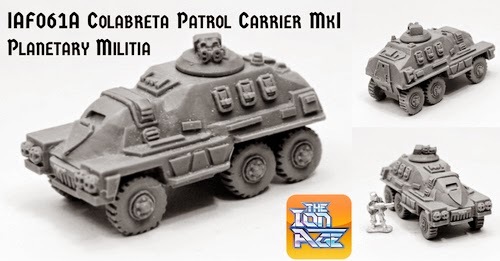 Planetary Militia packs and Platoon released!